Welcome to Light City. Today is High Productivity Day. Happiness through acceptance. Productivity through happiness. Tonight’s mandatory entertainment is a serial titled The Natural History of Fear. Remember, your State loves you. Your State wants you to be happy. Dystopias are familiar territory for Doctor Who. Vengenace on Varos saw the Sixth Doctor take on a “bread and circuses” society where entertainment is used to distract its citizens. The Happiness Patrol was Seven’s take on the Thatcherism of the 1980’s, while The Sun Makers had a thing or two to say about oppressive taxation with Four as its catalyst. If you’re using a story to make a political or sociological point, however, the story in question must be entertaining in order to be effective. With a decently done plot to provide an assist, the points the writer wants to make can hit home solidly and in such a way to make the viewer think. With a poor plot or shoddy workmanship, the key themes become laughable to the viewer (the “meat is murder” aspect of The Two Doctors) or dropped like anvils to the story’s detriment (Charles Darwin’s instant crisis of faith from Bloodtide). The Natural History of Fear is a story that really wants to both educate and entertain. Veteran Doctor Who scribe and sound editor Jim Mortimore obviously has a thing or two he wants to say about acceptance and conformity, and gives us a gripping tale about life and rebellion in the heart of an all-seeing, all-knowing city-state. Paul McGann and India Fisher are great, along with the supporting cast, while the sound work and dialogue set the scene of a society not too far removed from our own. The plot twists and turns for three episodes, but at the expense of being a bit clever for its own good as the fourth episode risks rendering the whole thing meaningless. It’s either ironic or a conscience choice that the setting of The Natural History of Fear is a place called Light City. In Light City, memories are wiped and new ones imprinted on its citizens to make them tick. It’s very similar to a great movie (if you haven’t yet seen it, seek out the Director’s Cut) called Dark City, where memories are wiped and new ones imprinted on its citizens to SEE what makes them tick. Within the walls of the city-state, an official called the Editor, with the assistance of the Conscience, can fundamentally change the personality of any citizen they choose. Old memories can be removed or rewritten while new memories can be implanted. A married wife could become a spinster in the course of an hour and never know she was once happily in love with someone else. A mindless prole could become the new Conscience should they fit the profile. A man is the sum of his memories, after all. Because of the shifting about, it’s tough to say “Paul McGann did great with his part.” So let’s just say that Paul McGann did a great job with his PARTS. 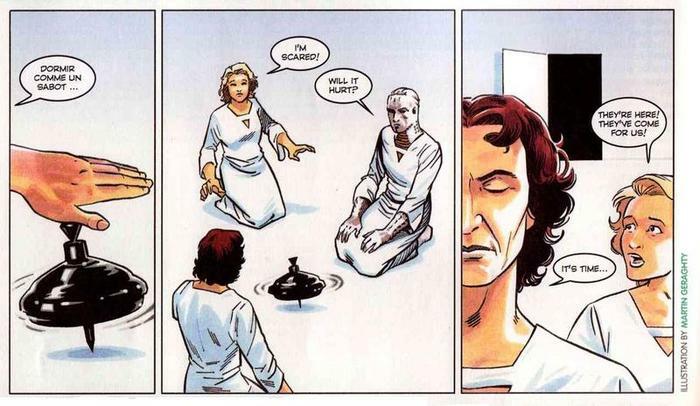 In Scherzo, McGann was the Doctor, just the Doctor, stripped of everything but his mind. 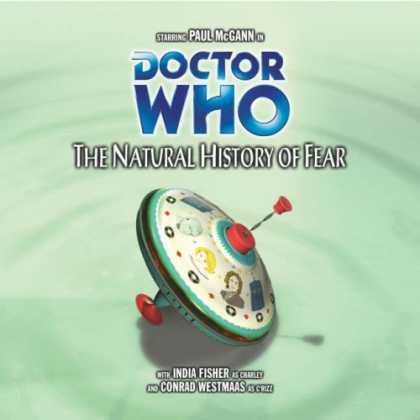 The Natural History of Fear goes full-tilt in the other direction, as McGann plays a wide variety of parts. He’s not just the Doctor, and to mention the other parts he plays risks giving away the story. The script for this play gives McGann a chance to really expand his range and play someone other than the Doctor (or the Doctor with amnesia) and he runs with it. Acceptance, concern, suspicion, anger, rage, disbelief; McGann handles all of these differently depending on the “role” he’s playing. It’s not “three angry people with the same type of anger,” but “three angry people with three different types of anger.” But even then, there were glimpses of the Doctor peeking through each “role.” It makes the listener wonder if Light City has recorded over the Doctor’s personality, much like an old cassette tape, where the sounds of the previous recording will sometimes echo during the time between songs. After the dreadful writing of The Creed of the Kromon, India Fisher, much like Paul McGann, nail her part(s) in this story. Much like the Doctor, Charley’s personality will whisper throughout her performances as a wife and as other…positions…within Light City. There are parts where Fisher is reduced to screaming, but it makes perfect sense given the fear that everything she knew about herself will be gone…and she won’t even know it was gone in the first place! The rest of the cast is hard to put a finger on, as their parts and roles shift from scene to scene, but I can safely say that they did a bang-up job, without a weak link between them. The weakest link of the story is Conrad Westmaas, and that’s because he’s not in the story very much. He doesn’t even show up at ALL in the third episode. It’s very disconcerting considering this is C’rizz’s second story and first as a full-blown companion that he doesn’t get a WHIFF of character development. I wonder if this story was written for just the Doctor and Charley and C’rizz had to get shoehorned right before production commenced. Jim Mortimore is known for penning several Doctor Who novels, but he’s also done sound and musical work for several Big Finish Who audios, including The Rapture, of which the music was the SOLE high point. There’s no denying Mortimore does an incredible job of outlining Light City as being familiar, yet different to the listeners. The sound work alone is incredible; the synchronized steps of the proles, the sounds of everyday activity going on while a body slams into the pavement, the echoing, sterile halls of Light City’s elite. And the words…infotainment, breakfast cubes, the Restoration Agency, all casually mentioned to establish the world. The Natural History of Fear is a serial that relies on dialogue to tell its tale. There’s very little direct action and a good bit of “talking” and a smattering of “walking and talking.” On one hand, Mortimore keeps the dialogue going and the exposition light. The conversations do move the story forward and keep the listener engaged. On the other hand, sometimes the dialogue devolves into nothing more than shouting, and it does get a bit tricky to keep track of who’s who and when’s when. Towards the end, it begins to double back and twist upon itself, leading up to the big revelation. And it’s here that the story falters. The curtain is pulled back for the big reveal of just why the Doctor and his companions have had their stories played as infotainment, and just who the citizens of Light City really are. What’s meant to be a “wham line” where the whole thing comes crashing down gets lost in the shuffle due to poor line delivery. The entire story hinges on that one line and it just comes off incredibly flat. But that’s not the weakest part of the climax. Light City is carefully planned, carefully overseen, and that means that sometimes, stress and pressure need to be released for the machine to keep functioning. It’s a never ending cycle where Light City is built up, the pressure causes it to collapse, and the whole society starts over again, evolving and adapting to be a “better” society in the process. The Doctor’s presence merely hastened the moment when the pressure needed to be let off. What this means is that, for the purposes of The Natural History of Fear, the Doctor, Charley, and C’rizz are completely superfluous to the story. Their presence is unnecessary. The Doctor is a catalyst for change, but that violent change would have happened anyway. The Doctor’s presence simply accelerated the process and changed it slightly by incorporating the asking of questions. So instead of death by flood, it’s death by fire. The entire premise of Doctor Who is that the Doctor never shows up, observes, and departs. It’s that he arrives, raises hell, and leaves. The presence of the Doctor is fundamental to EVERY story; television, audio, comic, newspaper, novel, what have you. If you take the Doctor out of the story, then the story just doesn’t work. Or, things get even worse in the case of Turn Left. Here, if you took the Doctor out of the story, the story still goes on in the same manner, just it takes a little longer for things to happen. You could change the Doctor to another character entirely and the story would still be the same; an absolutely superb piece on dystopia with Paul McGann and India Fisher as the leads. The Doctor doesn’t NEED to be in this story, and that’s why it stumbles at the finish line. Paul McGann is the Doctor in…The Twilight Kingdom. This entry was posted in Big Finish Review and tagged 4/5, Big Finish, Big Finish Review, C'rizz, Charley Pollard, Divergent Universe, Doctor Who, Doctor Who Review, Eighth Doctor, India Fisher, paul mcgann, TARDIS. Bookmark the permalink.